Aerial work platforms (AWP) describe a group of elevated machines that includes aerial lifts, elevating work platforms, and mobile elevating work platforms. They may also be referred to as cherry pickers or scissor lifts. Generally, aerial work platforms are used for a variety of maintenance and construction purposes and operated by a wide range of professionals. No matter how or where an aerial work platform is used, all operators are required to complete an aerial lift certification by OSHA. This training ensures that all workers are competent in operating all types of aerial machines properly, and are prepared to prevent accidents involving aerial work platforms in the following situations and industries. 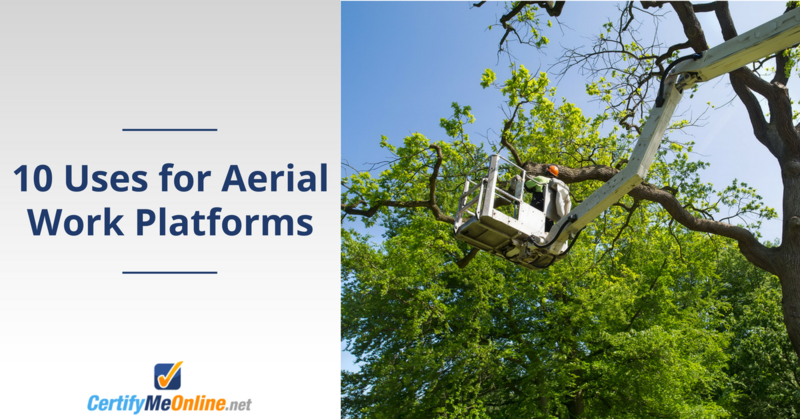 This article will examine 10 real-life applications for the aerial work platform. Some of the jobs might be familiar, while others aren’t so obvious. One thing is for sure. If workers and material are required for work above ground, an aerial work platform is usually the best bet to get work done! But before you head into the air, you need a well-grounded (and well-rounded) knowledge of how to operate aerial lifts, scissor lifts, and other aerial work platforms. That’s where our training comes in. More on that later. The types of aerial work platforms typically used in construction are aerial lifts, articulating boom lifts, and telescopic boom lifts. Aerial work platforms are made for reaching levels of heights that other types of machines cannot. Telescopic aerial lifts are designed for their maximum reach capabilities, and articulating boom lifts are helpful assets on construction and building maintenance sites that have structures in hard to reach areas. Articulating boom lifts have jointed boom arms that can reach up and around structures to access things like heat and cooling units, ductwork, piping, and more. From installing and repairing ductwork, accessing high up wiring, or installing structural features at height, articulating and telescopic boom lifts are the machines for the job. These types of aerial lifts can work on even and uneven ground, making them suitable for rough natural terrain and semi-finished building sites. When working on construction sites, it’s very important that aerial work platform operators are highly trained and certified. Being electrocuted by power lines and hit by other overhead structures are some of the top causes of aerial lift accidents, including fatal falls. Think of a large airplane or a bridge. How do people get up there to make regular safety inspections? Aerial lifts are the best way to transport engineers, inspectors and other safety workers to where they need to be. Yes, even OSHA uses aerial lifts when making regular inspections at warehouses, production centers and other places all across the country. During accident investigations, OSHA also uses aerial lift platforms, scissor lifts, and other equipment to reenact incidents that caused an on-the-job mishap. Whether it’s a bridge, airplane, or other safety inspection measure, aerial work platforms are commonly utilized all across the country! Ever wonder who cleans the windows at the top of a building? Aerial work platform operators! Those big-city skyscrapers need someone to wash the windows, and aerial lifts are commonly used to hoist workers many floors above the street. From boom lifts to smaller scissor lifts (used for interior windows), AWPs help keep your “window to the world” squeaky clean! Aerial lifts, articulating boom lifts, and telescopic boom lifts are made for reaching otherwise inaccessible heights. Designed with a basket or bucket on the end of the boom arm, these types of aerial work platforms can hold workers and the necessary tools needed to install, repair, and clean windows. Telescopic boom lifts are often used for window work because they’re equipped with the reach power to access the highest windows on a building. They can lift and situate the window washer directly in front of the work area. Scissor lifts can also be used to wash and repair low to medium height windows because their large platform allows for multiple workers and plenty of tools. Scissor lifts can only extend straight up, so they need to be placed directly under the work area. Operators will need to move them around or across the work zone to wash and repair all windows on a building face. No matter if you operate scissor lifts, articulating boom lifts, or telescopic boom lifts, you need to be trained to wash and repair windows on an aerial work platform. Falls from aerial lift platforms and buckets are a top cause of deaths among workers, and understanding fall protection is the key to preventing these types of accidents. Also known as aerial lifts, cherry pickers got their name because they were first designed and used for work in orchards, reaching and picking fruit. Today, they are used for that same purpose, amongst many others. Cherry pickers are narrow enough to operate between the rows of fruit trees while accommodating one worker in the bucket. The boom arm and bucket are situated on top of a vehicle chassis, allowing workers to access often difficult to reach rural areas. Being able to navigate around tricky work areas, like orchards, requires specialized training. When workers aren’t trained and able to recognize hazards present, they increase their risk for accidents like being struck by overhead objects, being crushed by objects nearby, and falling from the lift. Telescopic boom lifts are the most commonly used aerial work platform for electrical work. This machine is designed with the longest reaching arm that can extend vertical and horizontal. The operator working the controls positions the boom lift directly underneath the work area, while another worker stands up in the bucket or basket and accesses the electrical line. 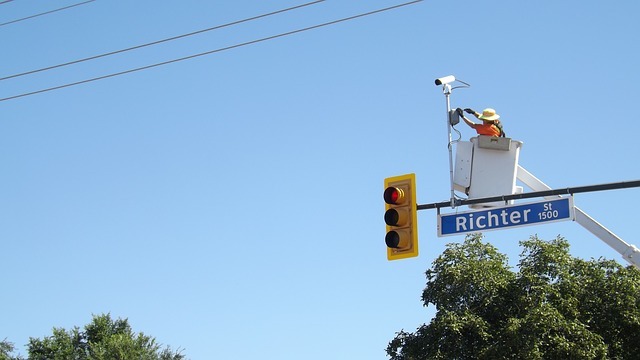 Electricians use aerial lifts to access telephone wires, transformers and other equipment that’s high above the ground. 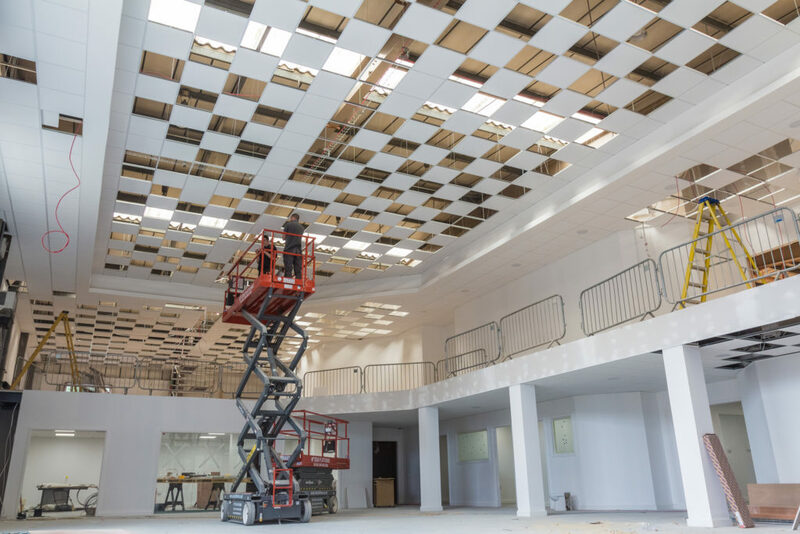 For indoor construction projects and common wiring jobs, scissor lifts are preferred, since a limited extension is required. For other electrical installation projects, aerial lifts are used to route conduit, fix electrical connections, and upgrade equipment. Telephone companies, industrial construction firms, and many others give their electricians AWPs to perform a ton of different tasks. Electrical line repair is a common job for aerial lift operators, but it’s also dangerous. With live power lines comes the risk of workers being electrocuted. When tasked with working with power lines for electrical work, operators must be trained and certified in the related hazards. Training teaches workers how to handle and work near power lines safely, to stay clear of any lines by at least 10 feet, to consider all lines live, and to use safety equipment and proper clothing. It’s often aerial work platforms that are the only thing tall enough to compete with trees. 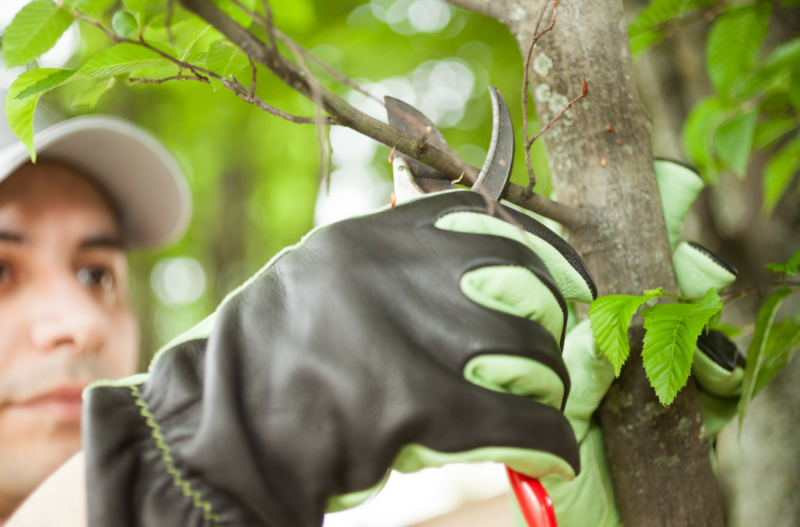 Arborists are the professionals who climb trees, cut down limbs and trees, and generally maintain trees on residential and commercial properties. Aerial lifts are often brought in to allow workers to reach the areas of trees that need to be worked on. No other equipment allows landscapers, tree trimmers and other similar workers to access trees quite like AWPs. Drive through your own neighborhood on a spring or summer day, and there’s a pretty good chance you’ll notice landscaping companies using aerial work platforms! Climbing a tree comes with plenty of risks, and an aerial lift can help arborists avoid accidents and OSHA has aimed to put more focus on tree care regulations. However, climbing is sometimes a necessity for tree work and many companies find that having both options at a worksite is the key to getting the job done safely and most efficiently. Celebrities like Katy Perry have used aerial lifts to hoist them up above the crowd and transport them around a stage to boost the wow-factor in their performances. Aerial lifts certainly make a statement, no matter where they are. Performing artists have often relied on using one in their show to impress their fans and make headlines. Aerial lifts are often used in the set-up of special events behind the scenes. Workers use aerial lifts to install the lighting for concerts, hang speakers and banners, and more. They also used in amusement parks like Disney and Universal to build and repair rides. As an aerial lift operator, you can be involved in special events around you much more often than a singer gets to ride one for a performance. Used for their power to lift and lower event staging and lighting, aerial lifts have been used for many sporting events across the country. Scissor lifts are often used for this application, from accessing scoreboards and arena structures to providing an eagle eye view of the stadium. East Carolina University (ECU) in Greenville, NC has made interesting use of scissor lifts for sporting events. ECU uses scissor lifts to upgrade their safety and security at Dowdy-Ficklen Stadium, the home field for their football team, known as the Pirates. Police at ECU have come up with a better way to keep an eye on the crowds, both in the stadium and when everybody leaves. When ECU opens their regular season each year, university officials think everything will run more smoothly thanks to the scissor lifts. Most amusement parks have their own aerial work platforms on hand at the ready to access a roller coaster should any malfunctions occur, possibly trapping park goers on the ride. Telescopic boom lifts have the reach power needed to access the highest point of many roller coasters and can even bring guests down to safety if an emergency arose. Aerial work platforms come in many shapes and sizes and are used for many applications. Scissor lifts are smaller in scale than aerial lifts, telescopic boom lifts, and articulating boom lifts and are often used indoors. Electric scissor lifts are propelled by a system of crisscrossing beams and can only extend vertically, straight up from the base. They are used in many retail settings to perform building maintenance and repairs. Many electric scissor lifts are made with narrow platforms and are also used in warehouses to handle various loads. They don’t emit fumes so they are safe for work around citizens and workers. Many packing plants have aerial lifts that can hold boxes, packages, equipment and other industrial products. These special aerial lifts have a larger platform with extra space. If you’re a warehouse worker that knows how to use a forklift and AWP, you’re a valuable employee! No matter how or where aerial work platforms are used, the key to performing all of these different types of jobs successfully and safely is to ensure all workers are trained and certified. Aerial lift certification is the number one tool for preventing accidents on the job and boosting productivity. CertifyMeOnline.net offers the number one online aerial lift certification course on the market. Students work through the training modules at their own pace and can immediately print their certificate upon completion. For only $75 for aerial lift and scissor lift training in one convenient program, you or your workplace can be compliant with all OSHA regulations and prepared to operate all types of aerial work platforms safely. We also offer Fall Protection training, along with a popular Train the Trainer course to enable anyone to become their organization’s leading OSHA resource! Our courses cover how to operate aerial lifts, how to perform inspections, how to assess the environment for hazards, and how to avoid accidents. Take a few minutes to create an account and complete aerial lift certification today! More on Aerial Work Platforms: Helpful Info and an Interactive Quiz! Do you know all the different types of aerial work platforms in use today? Would you like to learn more about AWPs you’ve never had a chance to operate? Check out this colorful, data-packed infographic. It describes the different kinds of aerial work platforms that are used for a wide variety of industrial and residential activities. From the super-functional “spider” aerial work platform to the more conventional telescopic boom lift, you’ll learn all about the different kinds of functions – and even fun – had by workers on the five main types of aerial work platforms. Ever wonder what type of aerial lift fits certain attributes? In this special interactive quiz, we’ve put together 10 true or false questions (no pressure – this quiz isn’t graded) that help determine which type of aerial work platform you are based on your answers. Articulated lifts, boom lifts, regular scissor lifts, aerial lifts and more – with just a few basic answers, you can learn more about any aerial work platform. Whether you want to expand your knowledge about aerial work platforms or just have some fun, this quiz is for you!